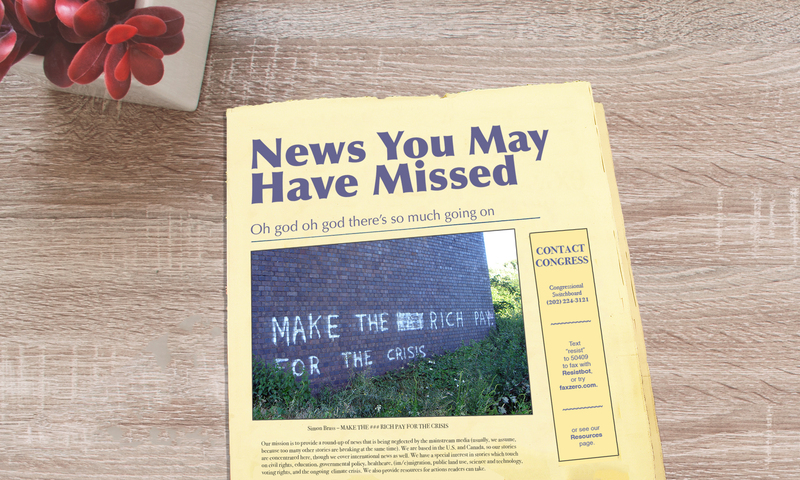 Our mission is to provide a round-up of news that is being neglected by the mainstream media (usually, we assume, because too many other stories are breaking at the same time). We are based in the U.S. and Canada, so our stories are concentrated here, though we cover international news as well. We have a special interest in stories which touch on civil rights, education, governmental policy, healthcare, (im/e)migration, public land use, science and technology, voting rights, and the ongoing climate crisis. We also provide resources for actions readers can take. News You May Have Missed grew out of Facebook posts by the founder, Joanne Merriam, rounding up important news she felt was being missed by the mainstream media in the aftermath of President Trump’s election. Those posts are preserved in our archives, though we have expanded to include more writers and viewpoints. We have a generally progressive viewpoint and don’t pretend otherwise; however, we seek to report the news objectively and factually, and make it clear when we are injecting our own opinions. All story sources are provided. We hope you will find our news round-ups to be useful to supplement your regular news consumption.